There are 21 people in this database showing their place of birth as GREECE - names are transcribed below. This database is available through Ancestry.com - if you do not have a subscription, most U.S. libraries offer access for FREE. 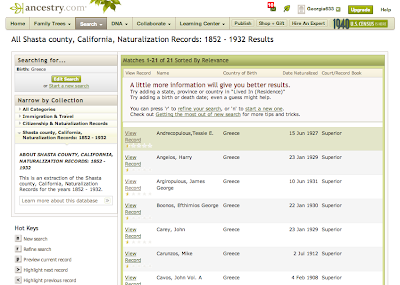 Shasta County Genealogical Society, comp.. Shasta county, California, Naturalization Records: 1852 - 1932 [database on-line]. Provo, UT, USA: Ancestry.com Operations Inc, 2001. 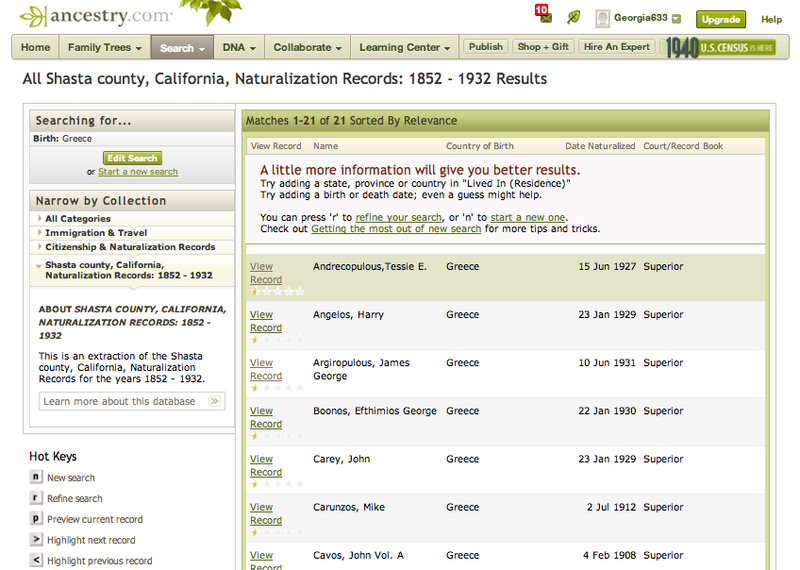 Original data: Shasta County California Genealogical Society. Shasta County, CA, USA: 1852-1932. Shasta County, California is located in the foothills at the head of the Sacramento Valley. In the 1850s this County was a center for Gold mining and later "Hard Rock" mining, lumber production and cattle ranching. An incomplete index was copyrighted & published in the Society's Jan/Apr/Jul 1982 “Shasta County Diggings.” It was completed in 2001 when the Society's original microfilm was recovered and contains some 1,840 names. It covers the period from 1852 to 1932. A great many of the immigrants listed in the index were hard rock miners and gold seekers and after the gold was "played out" they either stayed and mined in the major copper mines or moved on to other parts of the United States. In some cases, this index may be the only record for some of these individuals, particularly those that died here in the 1850s and 60s. The Great Register of 1890 and some of the earlier Great Registers have some of the same data but the County Clerk failed to enter many individuals in them, so this remains the only complete index.